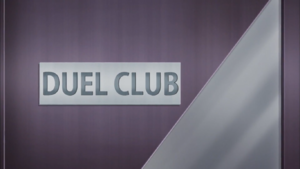 The Duel Club is an extracurricular organization at Den City High School in Yu-Gi-Oh! VRAINS. The group consists of students at Den City High School who sign up to learn rules and strategies for Dueling. Yusaku was following Skye Zaizen at school when he witnessed her entering the Duel Club. Naoki appeared at that moment and, noticing that Yusaku was wearing his Duel Disk, inferred that he wanted to join the club, but insisted that it was no place for someone with no interest in LINK VRAINS. Club president Hosoda opened the door from inside toSkye reprimand Naoki for making so much noise, but allowed Yusaku to join, stating that new applicants are always welcome. Yusaku was reluctant, but Ai accepted for him. After all the club members introduced themselves, Sato showed off his new Duel Disk, with Yusaku feigning interest about its new AI program that assists in Dueling. Skye commented that Yusaku knew a lot, and Yusaku said it was only because Naoki bragged about it, but he hadn't realized that everyone in the group had the new Duel Disk. Naoki took exception to this, and replied that Skye's brother Akira was a big shot at SOL Technology and gave the Duel Club members the new model first, prompting a stern look from Skye. When Ai tried to start a conversation with Skye's Duel Disk, Skye noticed that Yusaku's Duel Disk was a card-loading model, the same as Playmaker's. Naoki speculated that Yusaku was copying Playmaker (not knowing that they were one and the same), but lamented that Playmaker was behind the times using such an old model. Skye then asked to see Yusaku's Deck, and was scolded by Hosoda who thought the question to be rude, but Yusaku said it was fine and handed Skye his Deck (which was actually a dummy Deck instead of his real one). After Skye looked at the cards, she tried to give the Deck back, but Naoki snatched it up and started laughing about how lame the Deck was, to which Hosoda rebuked him for insulting it. Naoki then gave it back to Yusaku and apologized, but Yusaku told him he was right. Afterward, while Hosoda gave a lesson on the differences between Speed Duels and Master Duels, Yusaku kept staring at Skye. Ai told him it was a good idea to replace his Deck with a dummy one, and Yusaku told him to be quiet. The next day, while Yusaku was in the classroom, Ai told him that a Knight of Hanoi had appeared. Yusaku immediately left and went to the balcony behind the Duel Club to enter LINK VRAINS. The inside of the club room. ↑ 1.0 1.1 1.2 1.3 Yu-Gi-Oh! VRAINS episode 6: "True Blue"
This page was last edited on 29 June 2018, at 12:42.